Ideal for field or laboratory use, the Model 476A-0 Single Pressure Digital Manometer measures low pressures from -20 to 20" w.c. with ±1.5% full scale accuracy. Designed especially for the HVAC contractor, the Model 476A-0 can be used to set gas supply pressures, verify pressure switch operation, adjust regulators, check pneumatic systems and computer peripherals. The rugged, handheld unit is constructed with an extruded aluminum case for exceptional durability. The Series 478A manometer can be used to measure positive, negative, or differential pressures. The unit features selectable units, auto zero, hold and a Min/Max function. Press the Hold key to freeze the current pressure measurement on the display. 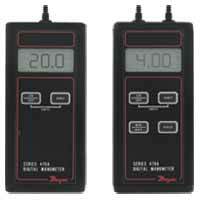 The 478A manometer includes a zeroing button to null out any minor pressure differences. Service: Air and compatible gases. Accuracy: ±1.5% F.S. @ 72°F (22.2°C). Includes linearity and repeatability. Pressure Hysteresis: ±0.1% of F.S. Pressure Limits: 5 psig (.34 bar). Compensated Temperature Limits: 32 to 104°F (0 to 40°C). Display: 4 digit LCD (.425"H x .234"W digits). Power Requirements: 9V alkaline battery. Battery included but not connected. Process Connections: Barbed connection for use with 3/16" or 1/4" I.D. tubing. Weight: 10.8 oz (306 g). A-402A CARRYING POUCH — Tough gray nylon pouch protects any Series 476A-0 Manometer. Double zippered for quick and easy access. With belt loop that snaps closed. 7-1/2"H X 3"W X 2-1/4"D (191 X 76 X 57 mm).